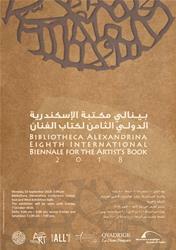 The BA is preparing to hold the 8th International Biennale for the Artist’s Book, to be inaugurated on 10 September 2018, 5:00 PM at the East & West exhibitions halls. The Biennale and its activities are set to continue until 7 October 2018. Dr. Chadi Adib Salama has been chosen as the Biennale’s commissaire for this round. This eighth round witnesses the participation of 37 independent artists representing more than 14 different countries, including Ireland, Poland, Slovenia, Serbia, China, Canada, Hungary, the UK, Iraq, the USA, Greece and Egypt. The event will also feature an exhibition that showcases two key collections, namely the “Writing the Divine Comedy” project collection—which includes the works of over 10 artists of different nationalities and is organized by Dr. Paolo Sabbatini, Director of the Italian Cultural Institute (IIC)—and the La Diane Française publishing house collection. La Diane Française specializes in publishing handmade books, and it is contributing to this year’s event with 18 new artist’s books by various European artists. The 18 works will be given to the BA by Jean-Paul Aureglia, Director of La Diane Française. Renowned Artist Ahmed Morsi will also be participating in the event with his book “Cavafy Suite”. 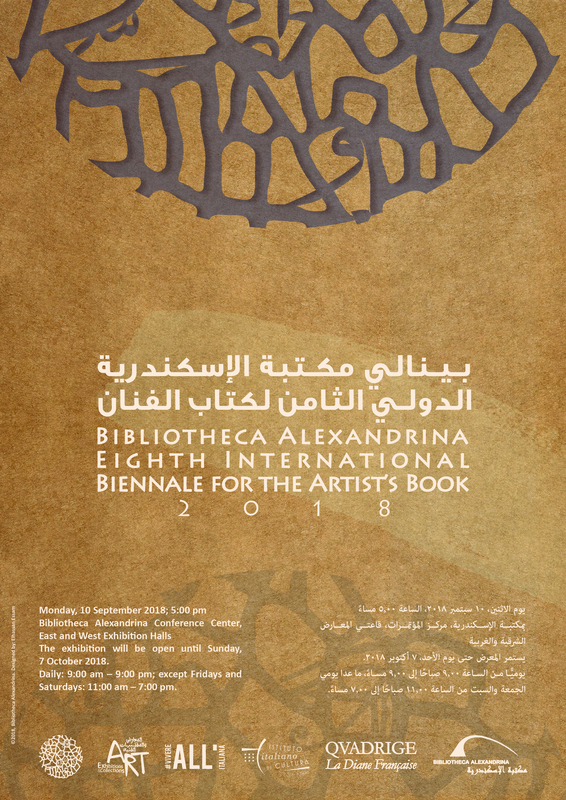 The 8th round of the Bibliotheca Alexandrina International Biennale for the Artist’s Book arises in 2018 as a state of “artistic riot”—an attempt to reach the most of what we can present as unique and individual contemporary thought from the creative experiences of more than 50 artists from over 20 countries. Each of the artists that were chosen and have agreed to take part in this round is a rebellious artist; one that defies upheld conventions and is innovative and experimental in terms of ideas and the chosen materials. 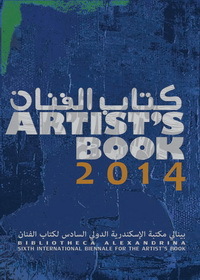 These artists were chosen to represent different and quite detached generations, and most of them have excelled internationally in various fields that are somehow connected to the Artist’s Book, either in terms of ideas or techniques. The 8th round biennale commissaire Dr. Chadi Adib Salama is a lecturer at the Faculty of Art Education in Zamalek, Helwan University, and a visual artist and exhibitions curator. He founded the “It Looks Like a Book” Studio, and he has held numerous solo exhibitions and participated in artistic events, both nationally and internationally, since 1999. He has also received several national and international awards. The Egyptian artists participating in this year’s round include Ahmed Abdel Karim, Ahmed Morsi, Osama Abdel Moneim, Ashraf Alhadi, Alfons Louis Gayid, Hazem el Mestikawy, Hossam Elsawah, Khaled Sirag, Dalia Refaat, Safaa Mohamed Attiah, Abdel Wahab Abdel Mohsen, Omar Toussoun, Mohamed El Masry, Mohamed Banawy, Mohamed Alaa, Mohamed Wahba, Mostafa El Razzaz, Maha George, Hagar Ragab, Heba Khalifa, Heba El Aziz and Youssef Ragheb. 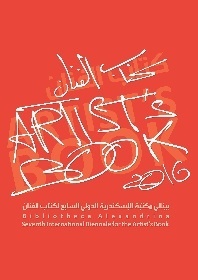 The Biennale will be accompanied by a series of activities that revolve around the field of the Artist’s Book. Said activities will be executed and held in cooperation with a group of artists and artistic associations from Alexandria and Cairo.